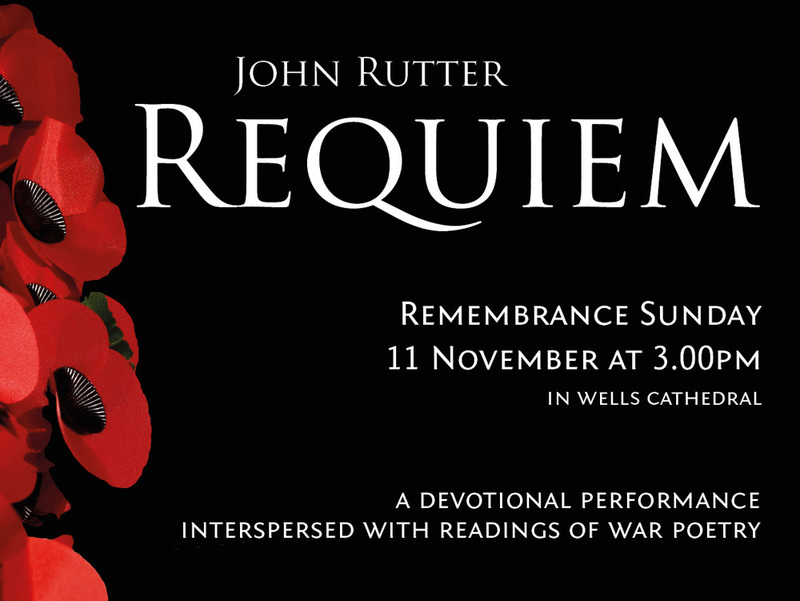 This Remembrance Sunday, the Cathedral Choir are singing in what will be a very special devotional performance of John Rutter's moving Requiem. The work not only sets the familiar texts from the Requiem Mass but also from the Book of Common Prayer, including a sublime setting of Psalm 23 (The Lord is my Shepherd) and also Psalm 130 (Out of the deep have I called unto Thee, O Lord). The Cathedral Choir are to be joined by the Wells Cathedral School Chamber Orchestra on this poignant occasion. Rutter says of the work: “Requiem was written in 1985 and first performed in the United States. Following the precedent established by Brahms and Fauré, among others, it is not a complete setting of the Missa pro defunctis as laid down in Catholic liturgy, but instead is made up of a personal selection of texts, some taken from the Requiem Mass and some from the 1662 Book of Common Prayer. The seven sections of the work form an arch-like meditation on themes of life and death: the first and last movements are prayers to God the Father on behalf of all humanity, movements two and six are psalms, movements three and five are personal prayers to Christ, and the central Sanctus is an affirmation of divine glory, accompanied by bells as is traditional at this point in the Mass. Gregorian chant is used, in fragmentary or disguised form, at several points in the work. Each of the two psalm settings has an instrumental obbligato, a feature inherited from Bach. Sunday’s performance forms part of Wells Cathedral’s World War One Centenary Commemoration. Admission is free and there will be a retiring collection in aid of The Poppy Appeal and Wells Cathedral Music. Older PostWhat a week that was!